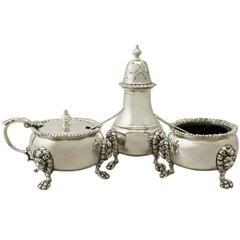 This fine vintage Elizabeth II English sterling silver three-piece condiment set consists of a salt pot, a pepper pot and a mustard pot. Each piece has a cylindrical form onto a collet shaped foot. The surface of each piece is embellished with a textured finish flanked with plain borders. Each item retains the original hallmarked plain subtly domed push fit cover surmounted with a tapering Art Deco style finial. 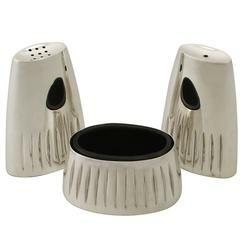 The salt pot and pepper pot covers are ornamented with pierced holes. The mustard pot is fitted with a removable blue glass liner. 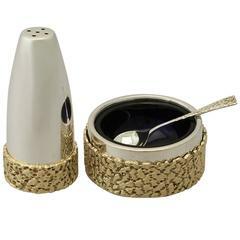 This condiment set is accompanied by the associated hallmarked English sterling silver mustard spoon. Dimensions: Salt pot and pepper pot Height to top of finial 6.3cm/2.5" Diameter 3cm/1.25" Mustard pot Height 5cm/2" Diameter 4.6cm/1.6" Total weight 4.4 troy ounces/138.3g (excluding glass liner) Condition This vintage silver condiment set is a very good gauge of silver, fine quality and excellent condition. Each item has been professionally polished and is in presentation condition. Full hallmarks struck to the underside of the base of each piece and part hallmarks struck to the interior of the covers are all very clear. Maker: J B Chatterley & Sons Ltd Origin: Birmingham, England Date: 1973 Video: A video of this fine piece is available upon request Reflections in photographs may detract from the true representation of these pieces of antique silverware. This set is a very good gauge of silver, fine quality and excellent condition. Full hallmarks struck to the underside of the base of each piece and part hallmarks struck to the interior of the covers are all very clear.